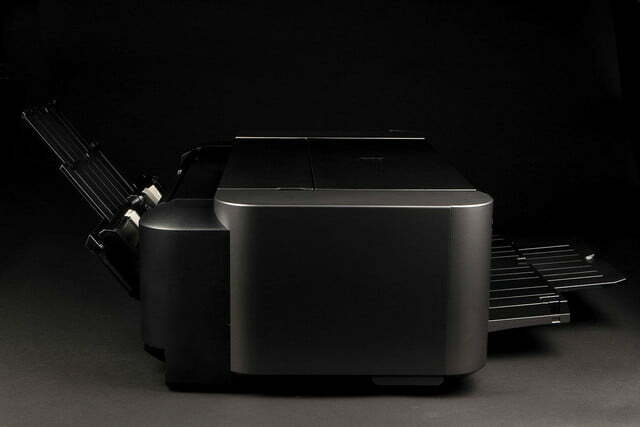 This large-format professional inkjet will give you print quality worthy of being displayed at an art gallery. Many of the photographs taken these days are shot with smartphones, and most of these cameras are between eight to sixteen megapixels, with a few notable exceptions. That’s fine if you’re going to post the images online or print them out at 4 × 6 or 8 × 10 inches, which a standard photo inkjet printer will suffice. But if you shoot with a digital SLR or other high-end camera, however, especially a “prosumer” model, it’s an entirely different story. These cameras capture images with a very high pixel count and enough metadata to produce professional-quality prints at very large sizes. To print these high-resolution images with the sharpest details and accurate colors, you’ll need a printer capable of doing justice to the image file. 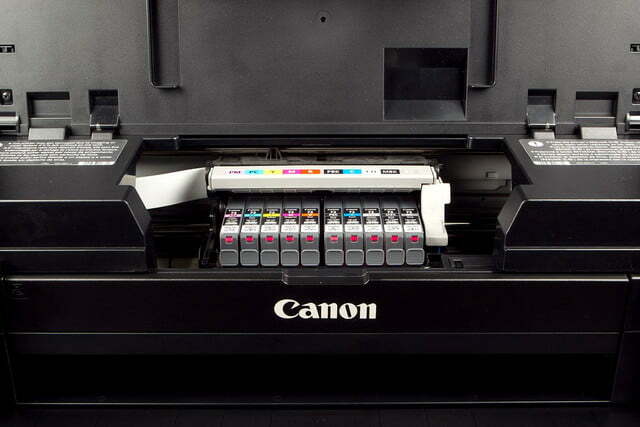 One such model is the Canon Pixma Pro-10 ($400), a wide-format photo printer specifically targeted at users who want the very best output. We’re talking prints worthy of an art gallery. Keep in mind that the Pro-10 is a very high-quality professional photo printer, not a general-purpose inkjet (here’s how to choose the right kind for you). 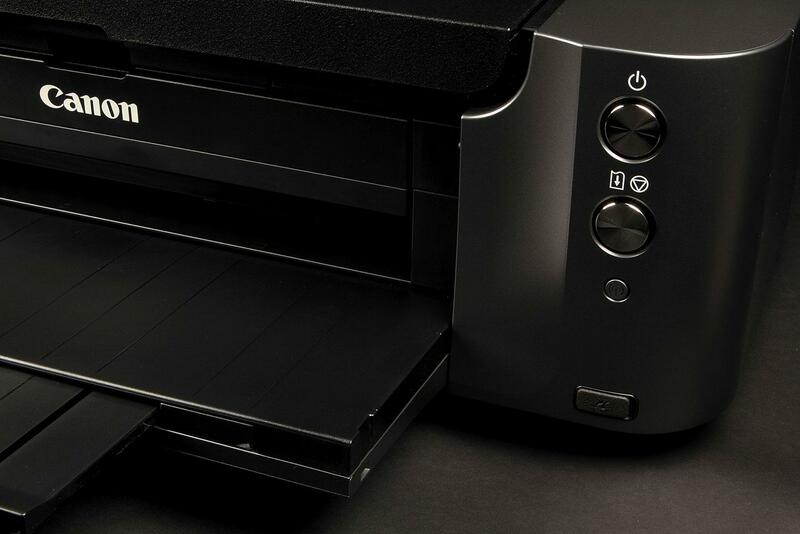 Even though Canon supplies the printer with the consumer-friendly My Image Garden, an extensive software suite with creative applications for making cards and banners, that’s kind of like using a Lamborghini for grocery shopping. 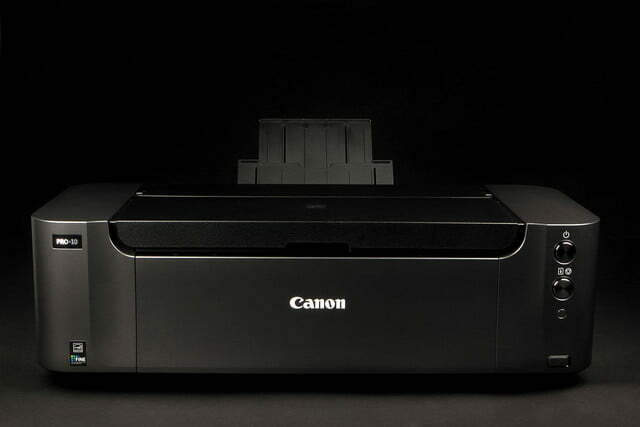 This printer is for putting beautiful photographs and artwork onto paper for displaying. Other than its sheer size, there’s nothing unusual about the Pro-10. It has very few controls, just a button and a paper feed/resume button below it. At the bottom right of the front panel is a USB jack covered by a plug to hide it; this is for use only as a PictBridge port for connecting digital cameras. Wide-format printers have varying capabilities. Depending on the intended market or use, wide-format printers may be able to handle roll, rather than sheet, paper up to 44 inches wide. The Pixma Pro-10 is somewhat more limited, having a maximum paper size of 13 × 19 inches. 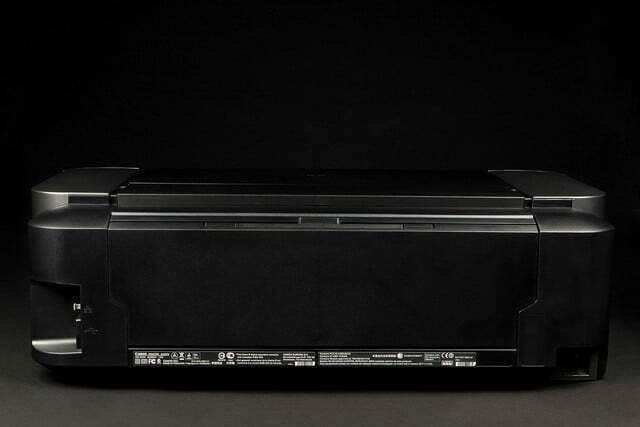 While some wide-format photo printers can handle 13-inch roll paper, the Pro-10 can only use cut sheet media. If you are willing to put in the effort in tweaking your photos’ color settings, and put up with the cost, the Pro-10 won’t disappoint you. 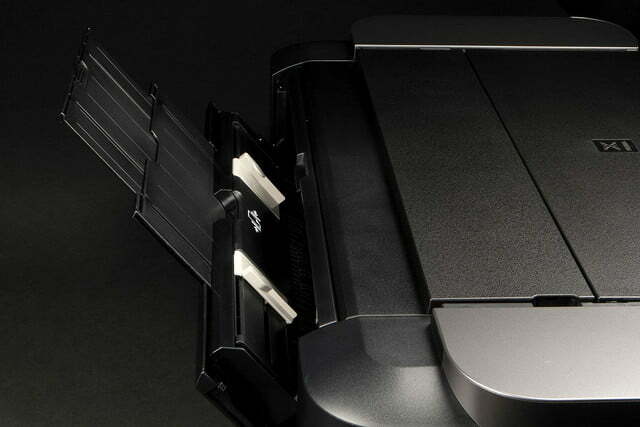 The front panel of the printer folds down and becomes the output tray. It extends to accommodate large sizes of paper. 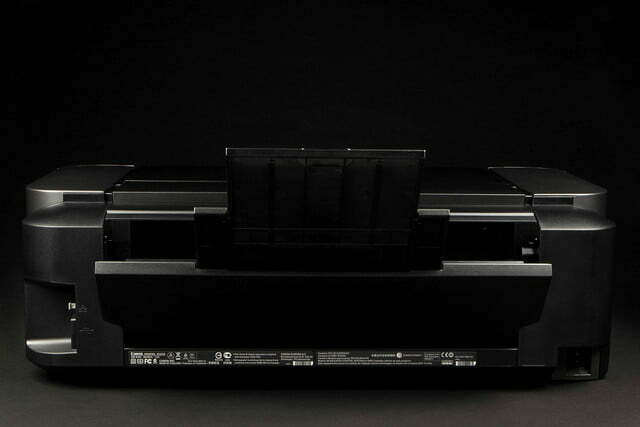 On the top of the Pro-10, toward the rear, are the two paper feeds. The one nearest to the front can accommodate 120 sheets of letter-size paper or 20 sheets of photo paper. Behind it, there is a single-sheet feed for use with specialty papers and heavier stock. 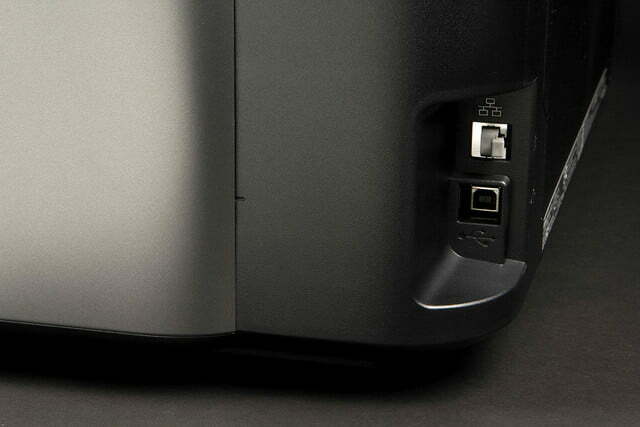 When all of the feeds and the output tray are retracted, the Pixma Pro-10 has a modern, sleek gray appearance. Nobody is going to not notice this on your desk or mistake it for anything other than what it is, but it’s no eyesore either. 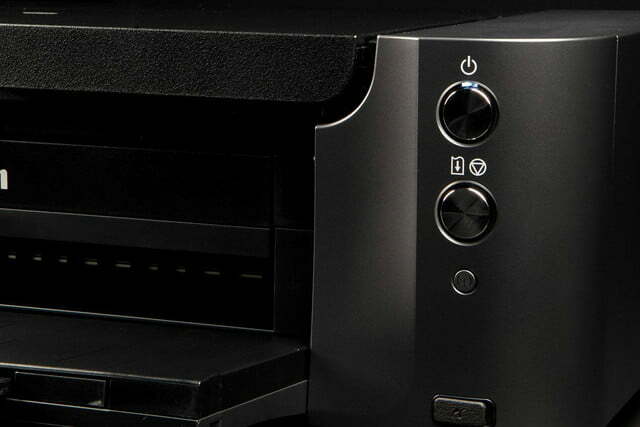 As with many Canon printers and MFP’s, the Pro-10 comes with a tray that lets you print on CDs and DVDs. We usually don’t get too excited about this feature, but with the high-quality output that the Pro-10 is capable of, if you take the time to set up the format using the My Image Garden utility that includes CD printing, your printed CDs/DVDs can come out looking like they were professionally printed. Besides the massive printer, you’ll find a power cord, a USB cable, a setup poster, two setup CDs (one for Windows, the other for Mac), a set of ink tanks, and a printhead. 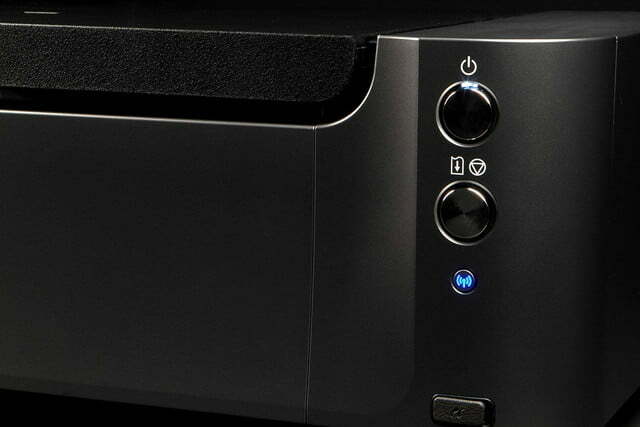 Not all inkjet printers use a removable print head, but it’s not uncommon on higher-end photo printers. A special tray for printing onto CDs/DVDs is included in the box. A detailed user’s guide can be found on the disc. 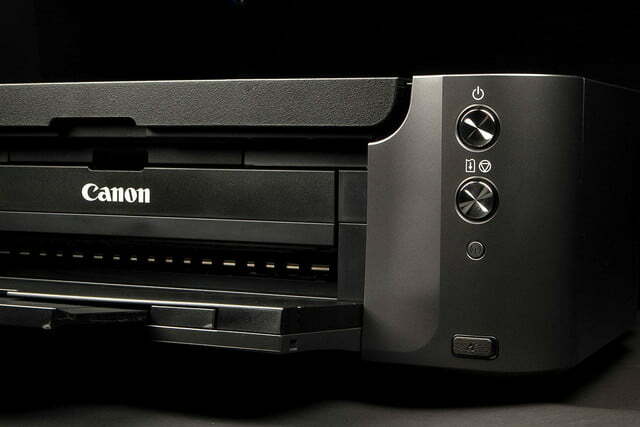 Canon provides several utilities to let you get the best use out of the Pro-10. For using the Pro-10 for more casual and creative tasks, My Image Garden, which is included with many of Canon’s consumer printers and MFPs, lets you print photos in a variety of formats; make collages, cards, calendars and other paper crafts; and even capture stills from videos. But given the very long per-page print times (see below), it makes more sense to use a less expensive, but much faster printer for these tasks. Setting up the Pro-10 wasn’t difficult, but it took more time than setups usually require. Unboxing the unit was awkward simply because of the size and weight of the printer (27.2 x 15.2 x 8.5 inches and 44 pounds). It wouldn’t be a bad idea to ask someone to help you get it out of the box and set it on a table. You should definitely set aside plenty of space for it. Once unboxed, the printhead and inks need to be installed. This is where you’ll need to exercise some care as the print head could be damaged by rough handling. 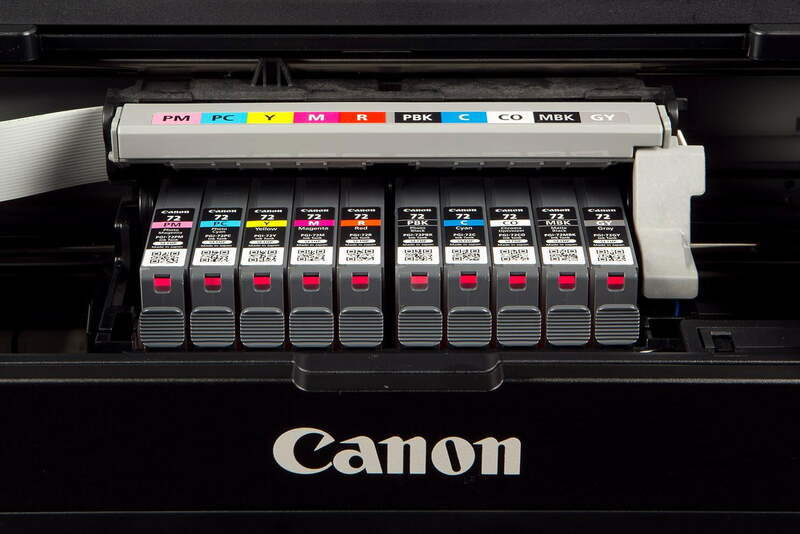 The Pro-10 uses 10 large-capacity cartridges of Canon’s Lucia ink, which includes six color and three monochrome inks: photo black, matte black, and gray, red, photo cyan and photo magenta. The tenth cartridge is the Chroma Optimizer, which is a clear coat that levels the printed ink surface for a smoother-looking print. The entire setup process, which included printhead alignment and software installation, took a bit over 20 minutes. 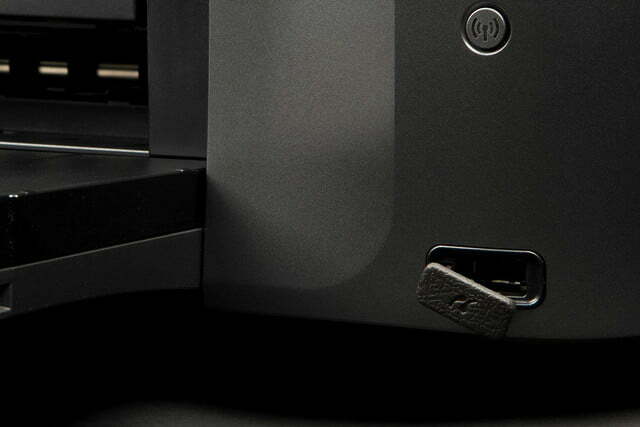 You can connect to the printer via USB, Ethernet, or Wi-Fi (802.11b/g/n). There’s the aforementioned USB input on the front for connecting a PictBridge-compatible camera, but there are no memory card slots, which would have been more useful. 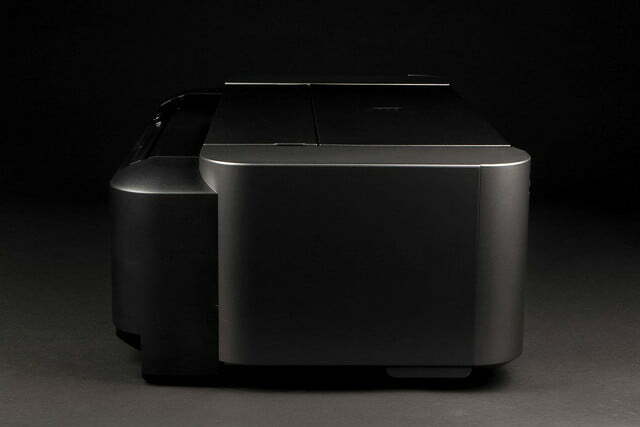 The Pro-10 does support Apple’s AirPrint protocol, which lets you print directly from an iPhone or iPad. 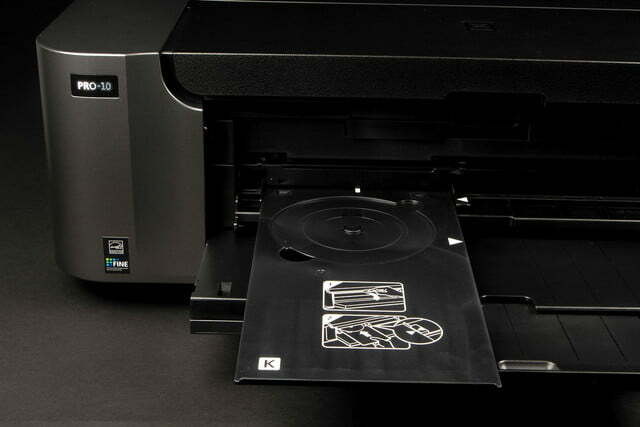 We generally test performance in two areas – print speed and image quality. With the Pro-10 we didn’t bother with print speed –the first page of our four-page Microsoft Word test document took more than four minutes to print, so we just stopped. 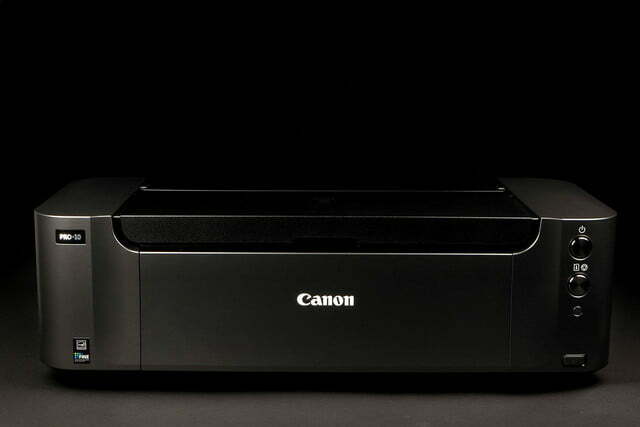 Canon is very upfront about this: The Pro-10 is a specialized inkjet, and isn’t intended for everyday printing. There’s nothing to stop you from printing a school report or letter if you wish, and text or text with graphics come out looking terrific – even when the driver is set in “Fast” mode (which isn’t that fast) – but it’s about the photos, which will take 3.5 minutes for an 8 x 10 photo with borders, according to Canon’s specs. To check out image quality, we printed our three test documents on both Canon’s Photo Paper Pro Luster – a sample of which is supplied in the box – and Canon’s Photo Paper Plus Semi-Gloss, at the highest-quality setting. The images on the two papers were identical – in a side-by-side comparison it was impossible to see any difference. And the quality was very good. It’s not just about color, either. 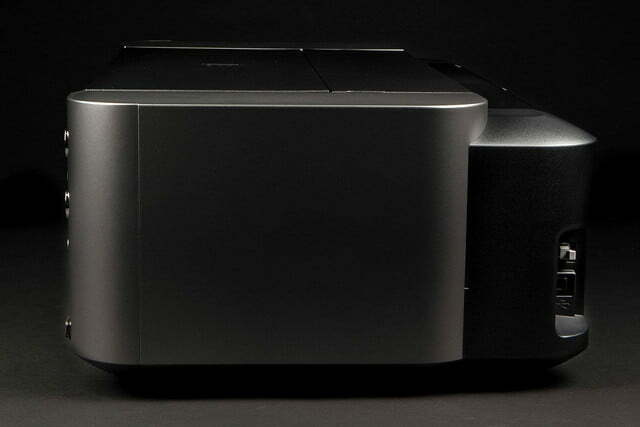 With the three monochrome inks, the Pro-10 can make really nice black-and-white prints. It was only when we compared the test prints against our reference prints that we noticed any of the problems. In all cases, the Pro-10’s prints were just a touch dark, and the red was just the slightest bit brown. None of these differences would be noticeable if the test images weren’t being compared to reference prints. To be fair, judging the true image quality capability on a prosumer printer like this involves much more detail and effort than our standard quality and accuracy tests. Getting the best results requires some knowledge of color management and ICC profiles (standards put forth by the International Color Consortium for color output). Few true photographers or graphic artists are going to use the standard ICC profiles for the specific paper type, and even if they do, the image is going to be tweaked in Photoshop or a similar application. It would have been easy enough for us to brighten the image using one of the tools Picasa 3 supplies for image editing or the one found in Canon’s My Image Garden. With the right adjustments, this printer will churn out really great looking output. Canon gives the page yield as 165 A4 (letter sized) pages from a cartridge. But the ISO (International Standards Organization) test protocol for determining page yield isn’t really valid for this type of printer. Ink usage is going to vary considerably depending on the prints that you make and the size paper that you’re printing on. Printing 13 × 19-inch images is going to result in a page yield considerably lower than the ISO rated yield. That’s not the fault of the Pro-10 – it’s just the nature of the beast. Wide-format printers from Epson and HP also suffer from the same phenomenon. A wide-format printer in general is a different animal from a standard photo printer. You can get exceptional prints from the Pro-10, but it’s going to cost you time tweaking the image and possibly doing multiple prints before you hit the right spot. It’s also going to cost significantly more in supplies, both in ink and specialty papers. There’s really no point in buying a printer like the Pro-10 if you aren’t using it to obtain gallery-quality prints. And that means using specialty papers, either from Canon or another supplier. Canon’s website provides a list of vendors and their specific papers for which there is an ICC profile available. But none of these things are negatives when measured in context of obtaining a print worthy of being framed and hung on the wall. If you are willing to put in the effort of tweaking your photos’ color settings, and put up with the cost, the Pro-10 won’t disappoint you.